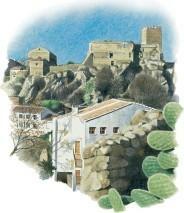 The springs and excellent waters are still very apropos in this district watered by the rivers Magro, Juanes, Buñol, Mijares and Júcar. Snaking through the canyons, running through deep gorges, rising up at mountainside springs or plummeting down cascades, water is a ubiquitous element in the Buñol Valley, and local fountains are very much a part of the picture in this scenic district. Route: From Cheste to Siete Aguas, visiting Chiva, Godelleta, Buñol, Alborache, Macastre, Yátova and Dos Aguas.